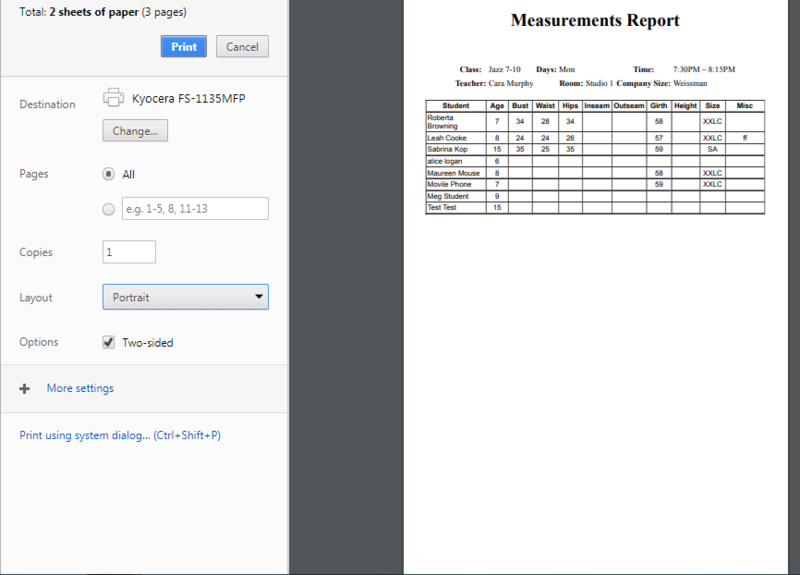 The Class Measurements Report will allow you to run a report to write in measurement or can be used after the measurements have been entered in the system and print them for your records or ordering process. This report prints with one class per page. Select the Season the class is in. The dates can be entered as today’s date for both. NEW! – You can select by*Costume Company* in the Company Dropdown. You can filter to find the specific classes. Select the classes you want to create a report for. Once you approve the data in the 2nd screen, click the green Print Roster button. Google Chrome will then open in a print preview screen page breaking per class. You may change print settings including the margins when you click More settings.